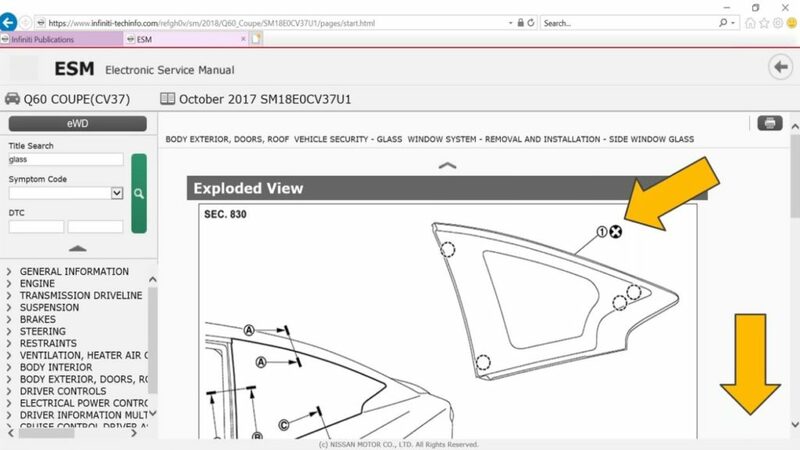 Auto body shops might be surprised by the number of one-time-use parts found on certain Nissan vehicles, based on a recent webinar held by Collision Advice and Nissan. 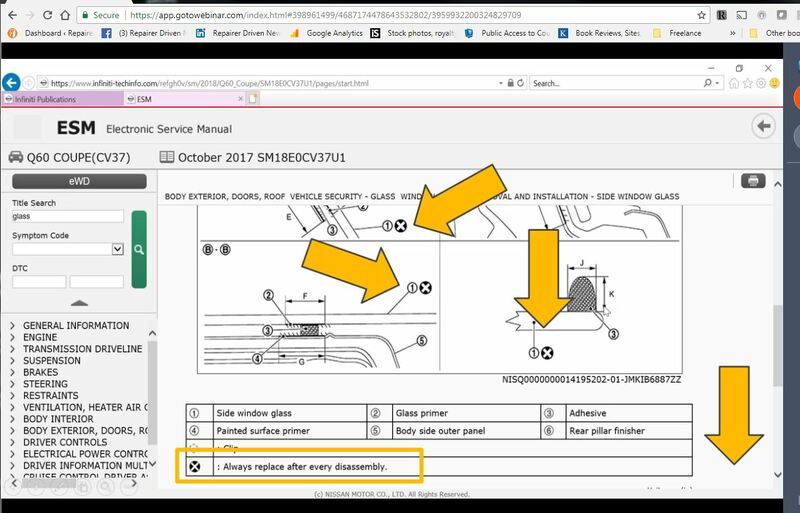 Collision Advice CEO Mike Anderson pointed out some examples during the Thursday webinar, the second in a two-part series from the consulting firm and OEM on how to use Nissan’s extensive online library of repair procedures and other resources. Nissan uses a black dot with a white X inside to reflect a component is one-time use, according to Anderson; the OEM also might declare a part one-time-use in text within an orange “WARNING” box. Many trim elements will be one-time use, Anderson said. 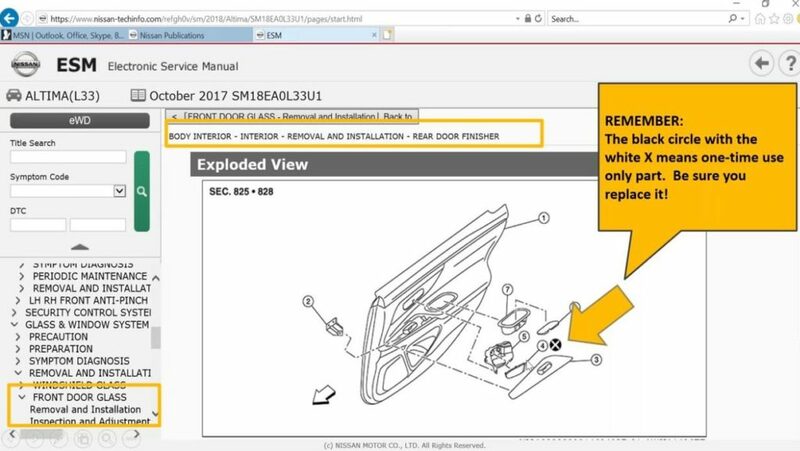 He showed the instructions for a door on a 2018 Nissan Altima, something a shop would R&I “every single day” to remove a door handle for blending. A small trim piece within is a non-reusable part. “Ladies and gentlemen, that was not located in the estimating system,” Anderson said. He said he checked all three, and none of the information providers classified that piece as a non-reusable part — only the original OEM repair procedures did so. Anderson praised an insurance appraiser who was conscientious enough to check out a repairer’s assertion that a piece of Infiniti quarter panel glass needed to be replaced, even though his estimating system didn’t contain that detail. The appraiser wanted to do right by the shop, Anderson said. 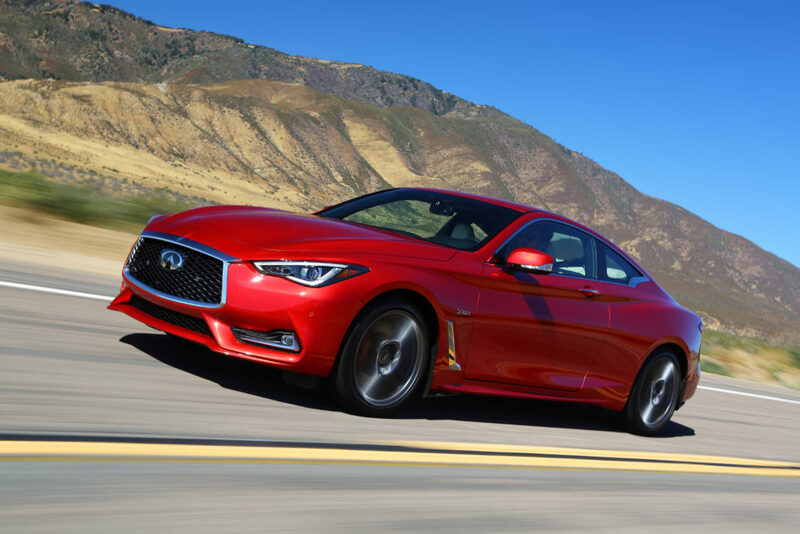 Anderson searched for glass-related repair procedures on the 2018 Infiniti Q60 coupe and confirmed that the quarter glass was indeed one-time-use. “Thank you for your dedication for doing the right thing,” Anderson told the adjuster. He said while he meant it in love, “shame on you” if you can’t find the necessary information. “You’re probably not looking hard enough,” he also. “They had it in here three different times,” he said earlier. 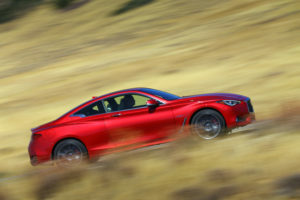 The Q60 also contains parts which must be replaced every time a shop removes elements of the bumper cover assembly, according to Anderson. “Infiniti has several non-reusuable parts here,” he said. “Here’s one that freaked me out a little bit,” Anderson said of the Q60’s grille. A part behind the Infiniti logo was flagged as non-resuable. Anderson researched the component and found it to be something called an ICC sensor cover; it’s related to the Q60’s adaptive cruise control, he said. But in this case, a non-reusable part carries the ability to render another part one-time-use. 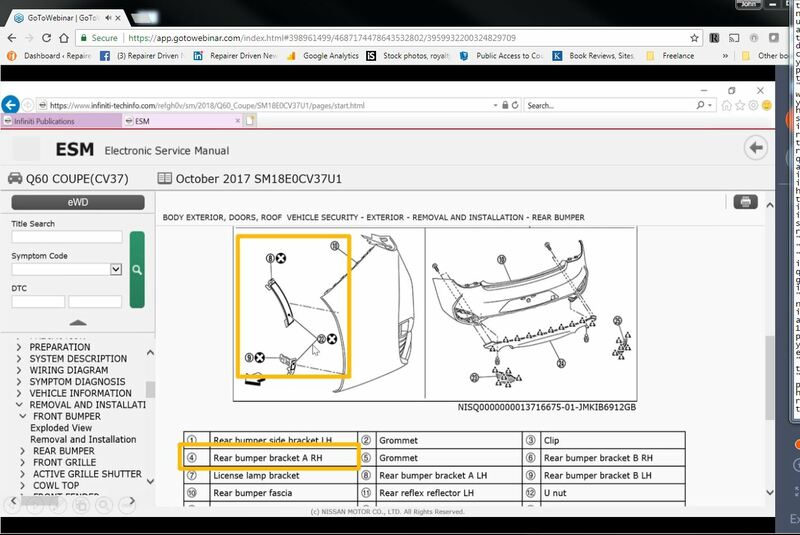 Per Nissan OEM repair procedures, whenever the sonar finisher or ICC sensor cover is removed, “never reuse front grille,” Anderson showed. Some Nissan/Infiniti seat-belt pretensioners might even be one-time use even if they weren’t in use during the crash. • The pretensioners cannot be reused after activation. They must be replaced together with the retractor and buckle as a unit. However, the actual service manual for the 2018 Rogue Sport states, “Seat belt pre-tensioners should be replaced even if the seat belts were not in use during a frontal collision in which the air bags were deployed” for the front and rear belts, which seems even stricter. We submitted a question to Collision Advice and Nissan late Tuesday about what to do in such situations where the OEM repair procedures seemingly conflict with a different Nissan communique but haven’t yet heard back. Similar instructions were found in the owner’s manual and service manual for the 2017 Nissan Altima sedan, suggesting shops should check for such rules on other Nissans and Infinitis they fix. 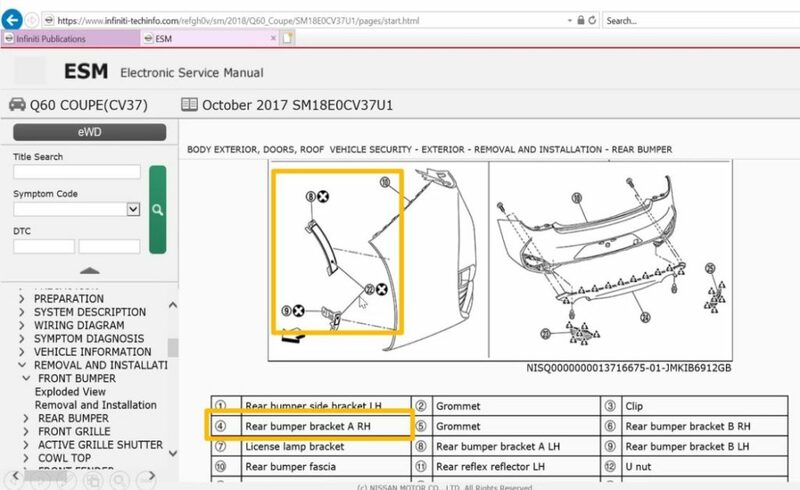 We’d recommend contacting Nissan to find out what they want you to do for any unactivated pretensioners you encounter, either through the “Ask I-CAR” portal, via nnacollisionrepairnetwork@nissan-usa.com (for certified shops) or completing the “help make this service manual better” form on the third page of a service manual. Nissan also offers free repair help on the Nissan Installer Repair Hotline, 855-828-4018, weekdays from 7 a.m. to 7 p.m. CST. 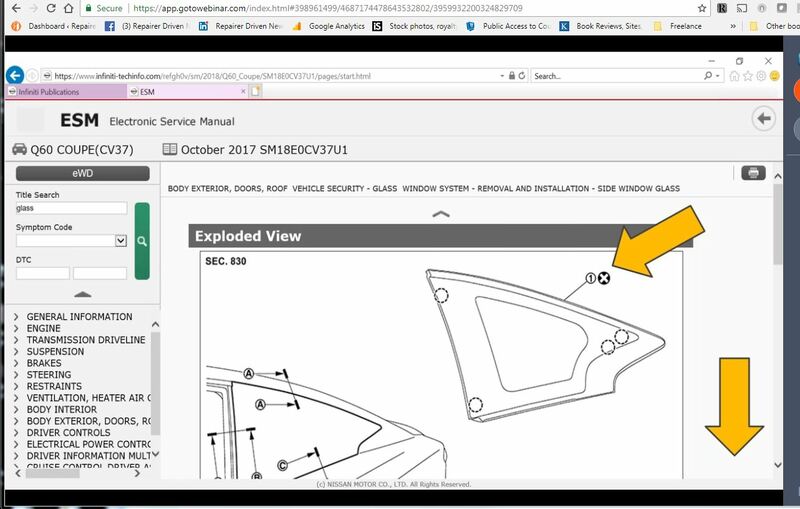 Anderson and Nissan’s webinar featured a couple of other one-time-use parts. Anderson called it “critical” to research OEM repair instructions “no matter what part you’re taking off the vehicle,” he said. 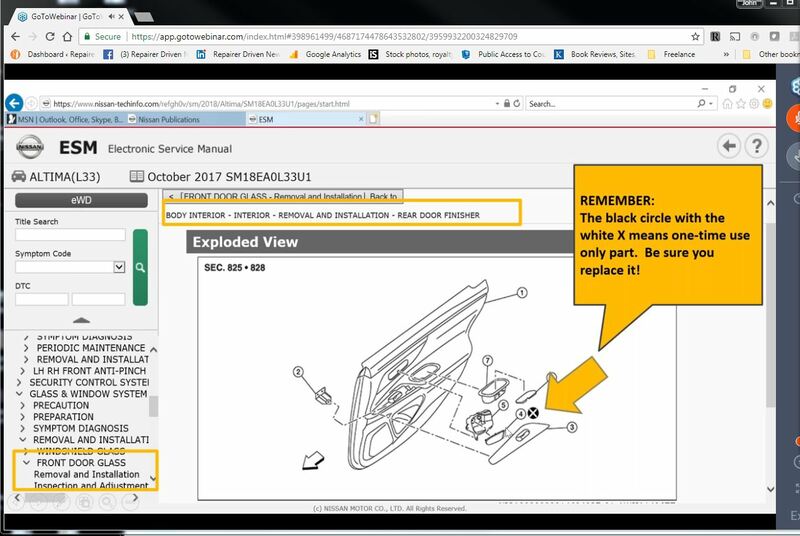 Anderson also mentioned that details on which electrical connectors are replace-only can be found on the OEM’s Tech-Mate website, a marketplace for repairers to buy such wiring and other tools. Why is it one-time use? Certain parts are only engineered to be installed one time and are not designed to be removed. 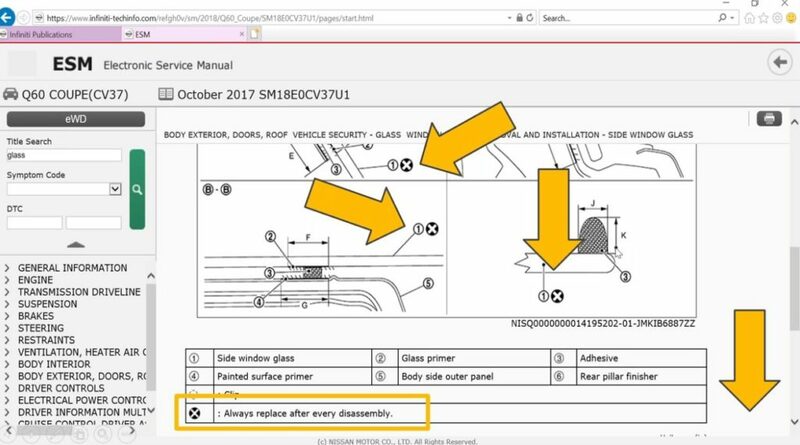 In a collision application, if you are removing a part that’s designed for installation only, you must discard the old part and install a new part. This varies based on the part and should be noted in the service manual.